Page 7 - KaBOOM! News | KaBOOM! Will you help KaBOOM! fight the Play Deficit? Our enemy isn’t a person. It doesn’t have a voice. It doesn’t jump out of the shadows. But it’s an enemy nonetheless. It’s the Play Deficit. And it’s a real threat to our children. Right now, an overwhelming majority of kids don’t have a safe place to play within walking distance of their home. Recess at school is on the chopping block across the country. And the public playspaces that do exist are often in disrepair. Children need play to grow into healthy adults, much as they need food, shelter, and love. Without play, kids fail to develop necessary skills like problem–solving, creativity, and perseverance. Will you help KaBOOM! fight the Play Deficit? Be a part of our Spring Donor Drive and your gift will be matched dollar for dollar by the A. L. Mailman Foundation. Create an interactive map so our research experts can identify areas where the Play Deficit is most rampant -- and concentrate our efforts there. 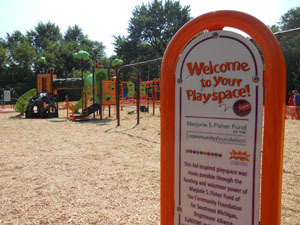 Open school and private playgrounds to local communities after hours and on weekends. Play is fun. But its loss is no laughing matter. Please help and let them play everyday. 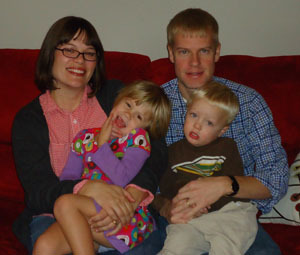 As a Schwab Social Entrepreneur of the Year in 2011, KaBOOM! Founder and CEO Darell Hammond has the opportunity to participate in the World Economic Forum next week in Davos, Switzerland. It's a chance to meet business and thought leaders, but also to advocate for something that sparks true entrepreneurial thinking: unstructured play. Unstructured play gives kids the space they need to tinker and take risks -- both vital for the budding entrepreneur. Yet, too frequently these opportunities are being taken away from our kids in favor of more structured activities or time in front of a computer screen. The lack of free, child-directed play time for our kids today will have dire consequences for these future leaders, making them less prepared to solve complex challenges and problems. That is one reason why KaBOOM! has embraced the concept of the Imagination Playground™ which uses loose parts and encourages kids to use their imaginations and be creative. 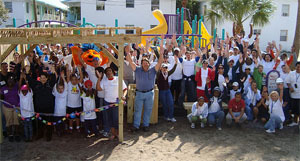 You can read the full post here: "Play Today, Lead Tomorrow"
On February 12th, 2011 KaBOOM!, the Police Athletic League of West Palm Beach and PNC Foundation turned the worst dumping site in West Palm Beach into a beautiful new playground. Now people pick up trash every day. They have a sense of ownership to the playground and do not want to see it trashed. It is an incredibly positive change in the community. 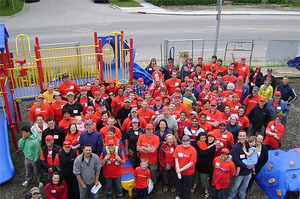 Play it forward to support communities across the country who make KaBOOM! playgrounds their own. 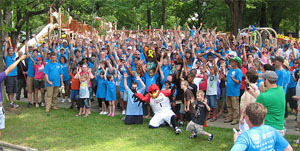 On June 21st, 2011, KaBOOM!, the City of Erie and the Pennsylvania League of Cities & Municipalities built a great new place to play in Erie, Penn. After the build the city requested the Build Plans for the benches and shade structures from Build Day. They were so satisfied with the projects that they want to duplicate the projects across other projects in the city. 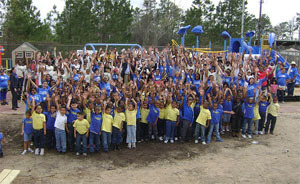 Play it forward with a donation today, because it may start with one playground, but it doesn’t end there. 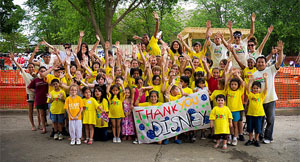 On June 4th, 2011, KaBOOM!, North Berwyn Park District and the Walt Disney Company built a great new place to play and an amazing new community garden in Berwyn, Ill. Marlene, the Chair of the Garden Committee, is now working with the park district to develop lesson plans for local kids. Her goal is to teach kids how to garden and get them interested in local, healthy foods. Play it forward with a donation today to help more people like Marlene take charge of their new community gardens.